Tom Yum or Tom Yum Goong is designated as one of the most delicious and favorite dish among Thais as well as foreigners. It’s not just found in Thailand but in majorly all Thai restaurants worldwide. 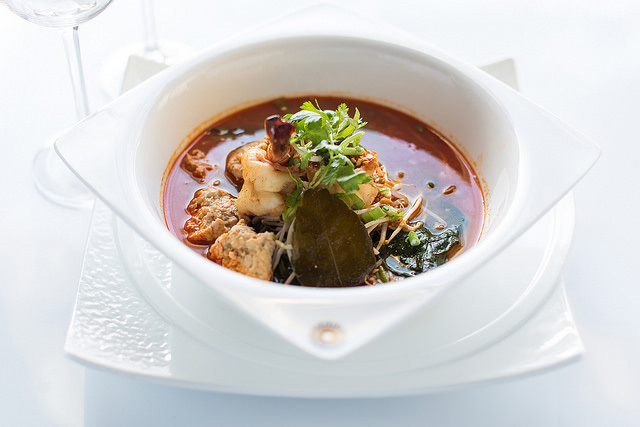 Tom Yum is usually cooked with shrimp, galangal, kaffir lime leaf, lemongrass and a choice of meat or vegetable. Both the version, vegetarian and non-vegetarian taste amazingly delicious and the choice of meat will be goong or shrimp. Generally, the soup is seasoned with the fish sauce, chilies and lime juice. Besides, there are some other optional add-ons as well including Nam Phrik Pao (chili jam) or sometime coconut oil or milk. Tom Yam is often hot and spicy in taste and is probably the most demanding soup in Thailand. If you are mad over Tom Yum, this post is going to highlight everything you want to know about this yummy soup from cooking method to ingredients and the recipe. So let’s go through with this and see how you can prepare your favorite Tom Yum yourself within a quick frame of time. and a splash of coconut milk if desired and serve hot. Tom Yum possesses properties 100 times more efficient than other antioxidants in hindering cancerous-tumor growth. Its ingredients like Ginger aids in digestion, turmeric is an anti-inflammatory, and lemongrass treats colds and ease tummy troubles. So Tom Yum is not just savoring dish but also boasts up a lots of health benefits.